To compete with space telescopes such as Hubble, current (and future) optical ground based telescopes employ a technology called Adaptive Optics. This technology uses mirrors to cancel out the affects of the atmosphere and provide near diffraction-limited images. One application of Adaptive Optics in astronomy is to resolve dense regions of stars in the centre of our Galaxy. When this application is combined with infrared spectroscopy we can start to hunt for the oldest stars in our Galaxy. 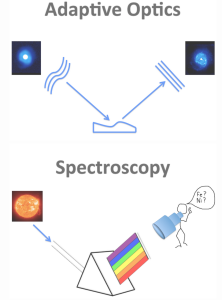 I will talk about the latest technologies in both Adaptive Optics and stellar spectroscopy and discuss some of their astronomical implications. pdf (36Mb) – no embedded video. Find AO video at the bottom of this web page. I was editing some videos from a grass fire in Duncan this week, Then I noticed the flashes across the screen. I think they could be meteorites And could have been what started this fire when a transformer blew .